Because it was my first time doing something on the sewing machine, the first part of the assignment was very interesting and fun. It was also not very difficult. I started by choosing two different fabrics, and then just following the steps, mentioned in the presentation. Since, there was a description for all the steps the process became very less challenging. 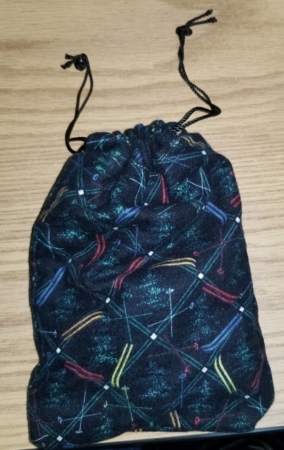 I wanted to use different fabrics for inside and outside of the pouch. The entire process was straightforward. I just encountered one challenge in finishing this pouch. 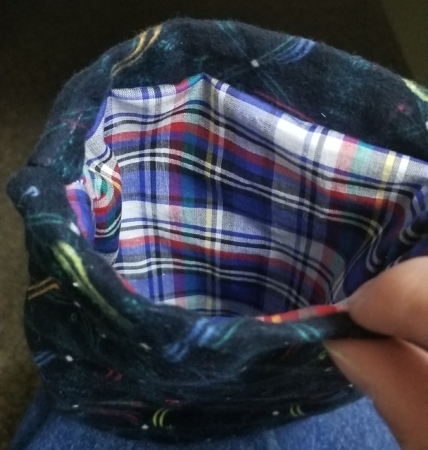 I made a mistake in sewing the part, where it transitions from one fabric to another fabric, because of which my pouch had a very small hole to insert a string. In an effort to insert the string, I broke a wooden stick inside one of the holes. It was a bit of struggle to remove the broken stick from a small hole. The pouch turned out to be okay, and of great use; since, I am using to store my earphones, phone charger, etc. 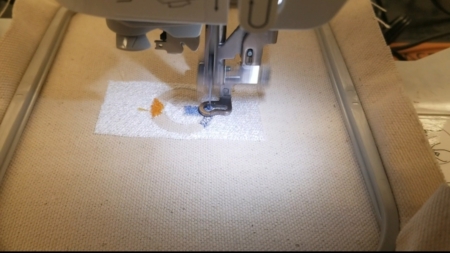 For the second part of the assignment, we had to create an embroidery patch, which has at least three colors. I chose the logo of google for this part. It had at least three colors, and was also not very complicated. First, we had to modify the picture in Inkscape, and then to embroider via PE-design app. I faced one challenge in making this patch. When I modified the image in Inkscape, it looked fine. However, when I imported that image in PE-Design software, it was around fifteen steps to finish the embroidery. I had some problem in my modified image, because of which I had to modify it again. After the modifications, the number of steps got reduced to five, and it worked perfectly. For the third part of the assignment, we had to create a sewn and embroidered piece. 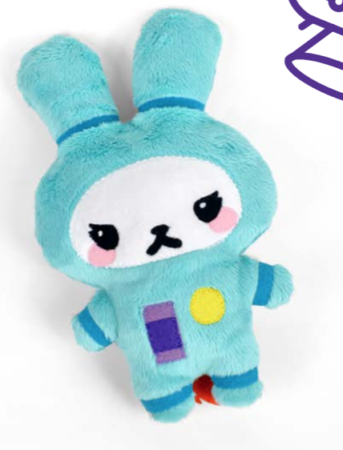 For this part, I decided to make a astrobunny plushy. Since, this part was longer than the other two, the entire process took me many hours. There was a step by step guide available, which was very helpful in the completion of this project. The first step was to collect different fabrics. I collected many fabrics of different colorS. After getting all the fabrics, with the help of paper layouts, I cut the different fabrics in shape of the main body, face, jetpack, jetpack flames, eyes, mouth, bands, front buttons, and front panels. After having the cutout of fabrics, I decided to work on the embroidery part. 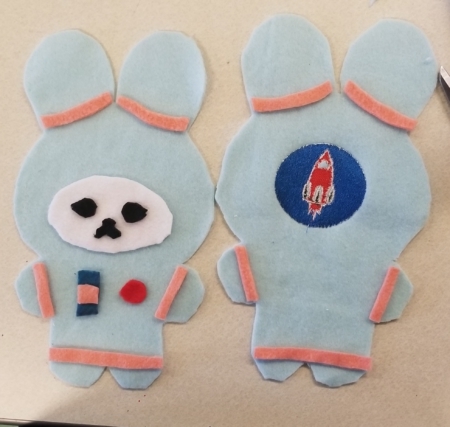 For that part, I decided to embroider a rocket on the back of the plushy. 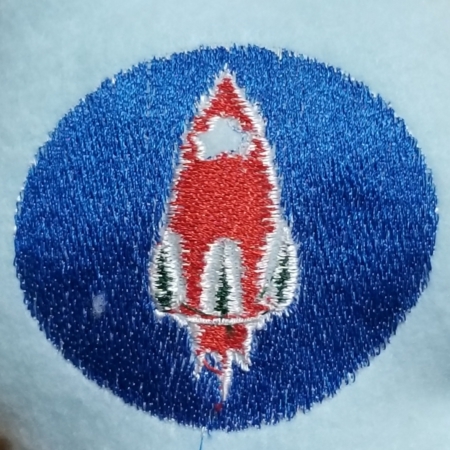 In order to embroider the rocket, I faced the similar problem that faced while embroidering google logo. However, it worked fine at the end. The rocket turned out to be okay, but I was happy with the outcome. After embroidering the rocket patch, I decided to arrange different parts on the main fabric. I started by sewing the face patch on the body, and then eyes and mouth on the face. I wanted to get done with one side of the plushy, and then continue to the next side of it. After sewing all the components of face, I sewed all the bands, buttons, and panel on the front side of the plushy. Later, I sewed all the bands on the back side of the plushy. With the step-wise guide, it was easy follow the steps and keep track of the process. After that, I sewed the front side of the plushy to the back side of the plushy. After getting done with sewing the body, I made a cut in back side of the body, and turned the right side out. Then, I stuffed the plushy from that cut. After stuffing the plushy, I worked on creating the jetpack. After finishing the jetpack, I hand-sewed the cut at back of the body and attached the jetpack at the back of the plushy. I never hand-sewed before, but it turned out to be fine. The plushy turned out to be good, and I was satisfied with the final product. I learned a lot though this assignment, and I did the stuff, like sewing and embroidery, that I would never have done without this assignment. It ended up taking a lot of more hours than expected, but I learned a lot of new skills. There were many challenges that faced, but every time I overcame them. I never did sewing and embroidery, and because of this assignment, I learned those skills. It was a great experience, and I enjoyed the process.